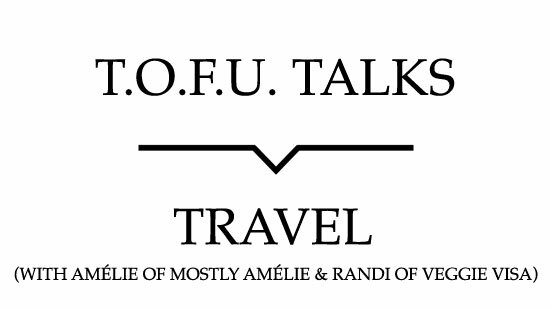 Join T.O.F.U.’s Editor, Ryan Patey, for a live chat with Amélie Gagne of Mostly Amélie and Randi Delano of Veggie Visa. Focusing on travel (vegan style, of course! ), I’ll be asking Amélie and Randi a series of questions about their adventures, travel style, experiences, and more before opening it up to the audience. To stay up-to-date before the event, join the event page on Facebook here. Amélie is the hungry and adventurous content creator behind Mostly Amélie. Originally from Montreal, Canada, she is now based in Berlin, Germany but who knows if that’ll last. Mostly Amélie is an inspirational blog focused on health-minded vegan travel with an emphasis on yoga and her inner journey at large. Her aim is to inspire others to push their own limits and be fearless. Follow her as she navigates this surprising world and things don’t always go according to plan. Some of the amazing things she’s done include cycling half way around the world alone, spending 10 days in silence in a Buddhist temple, diving 20 metres down in the ocean on a single breath and spending a full 2 years completely homeless in South East Asia. Several of Amélie’s vegan food guides are ranking #1 on Google. Randi is the co-creator of the vegan travel & lifestyle website Veggie Visa and the travel website Just a Pack. She is also a social media manager, has over 15 years of marketing experience and a background in culinary arts. Randi’s passions include cooking, yoga, and salted caramel ice cream.